SKU: N/A. Tags: cherry kush strain, cherry og, Cherry OG Kush, cherry og strain, cherry pie strain. Cherry OG is a 50% Sativa / 50% Indica hybrid marijuana strain bred by Emerald Triangle Seeds. It was created by combining Cherry Thai, Afghani, and Lost Coast OG genetics. It is a perfectly balanced strain that combines all the goodness of both Sativa and Indica. The buds of Cherry OG are interestingly small, and they have a dense arrangement that makes them look like the ripened cherries. Its oversized flowers are almost conical in shape. They are broad at the base and distinctly pointed at the end. The tightly-packed leaves are an earthy shade of olive green, shot through with hairy, rust-colored pistils. Transparent white trichomes lavishly cover the nugs, making them extremely sticky and difficult to break up without a grinder. Breaking off Cherry OG gives a flavor that expresses a mixture of sour-diesel and cherry notes. 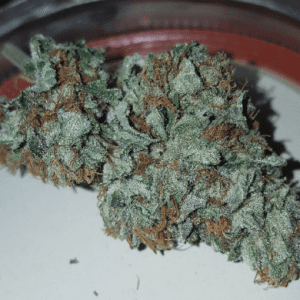 When combusted, this bud burns with a smooth and easy smoke that tastes like subtle cherry and blueberry with some added diesel notes on the exhale. Cherry OG marijuana strain stimulates an uplifting cerebral euphoria and high. It improves the mood, energizes body and mind, and prompts giggles and chattiness. It offers what can be described as a creeper of a high, steadily mounting until smokers can’t help but succumb to its effects. Along with a pressure at the front of the head, users may detect an onset of rapid thought association. Cherry OG deliver effects that helps patients focus on tasks as complicated as sorting your inbox or as boring as taking on spring cleaning. It delivers a mental energy can also be helpful in the temporary treatment of social disorders. Cherry OG is very effective in the treatment of ADD/ADHD, Anxiety, Chronic Pain, Depression, Insomnia, Loss of Appetite, Migraines, Nausea, and Stress. Awesome strain! Now I’m free and happy without pain. Very helpful, makes me feel great! So sweet!! Gives me a ton of energy! Amazing taste with a sweet smell !!!!!!!! Looks exactly like it tastes!!!! Very uplifting high. Got the creative juices flowing!